This entry was posted in Draws Shoots and Leaves and tagged words on December 31, 2014 by Draws Shoots and Leaves. The last post of 2014 and Draws Shoots and Leaves has been up and running (with two biggish breaks) for a year. I have been trying to establish a daily drawing practice for a couple of weeks now in the run up to the New Year. My thinking being, that if I can do a drawing a day while being away and during the Christmas period, I should be able to carry it on EVERY day – well ha! ha! and good luck with that – I tell myself. As this blog enters its second year I am dropping the Wednesday Word (of a Botanical Nature) and replacing it with a slide show of my daily drawings of the previous week in the sincere hope that there will be the full seven every week! 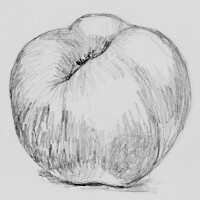 This entry was posted in Draws Shoots and Leaves and tagged a drawing a day, pencil, pencil drawing on December 27, 2014 by Draws Shoots and Leaves. This entry was posted in Draws Shoots and Leaves and tagged words on December 24, 2014 by Draws Shoots and Leaves. Still working with Wendy Hollender’s book ‘Botanical Drawing in Color’ I copied two of her drawings to try out her limited colours. 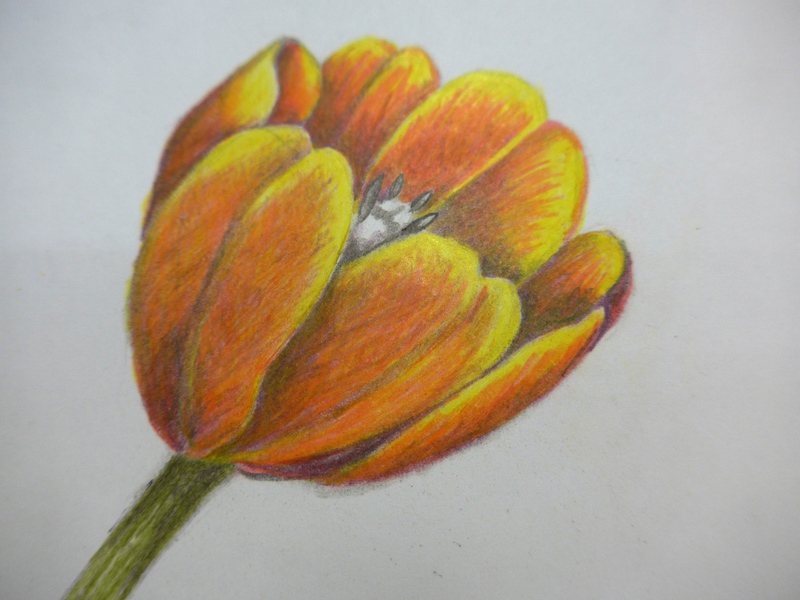 I tried a tulip, which I just drew out really quickly with graphite pencil and then coloured in following her step by step instructions. Then I followed the instructions for a bunch of crabapples. What I really noticed, was that she uses a much freer and more ‘sketchy’ way of applying the pencil to the paper, and looking closely at her images I can see individual pencil lines. This method is much quicker than trying to eliminate all traces of the makers mark which is how I have been doing things previously. 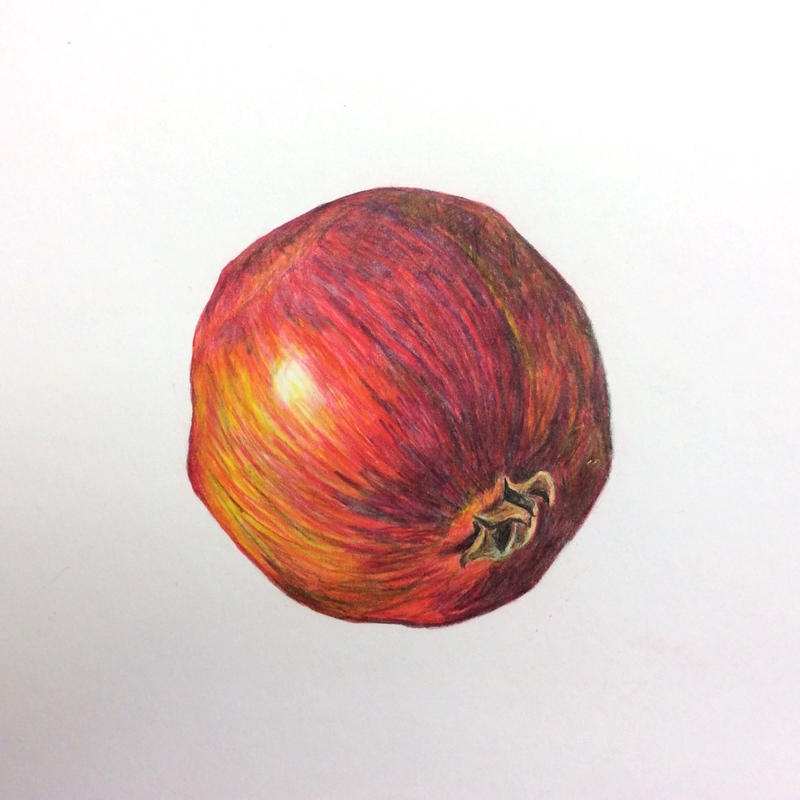 I then went on to experiment with an original drawing of my own of a Pomegranate. Now this was really fun to do, I loved building up the layers of colour, I loved the ‘scribbly’ speed of working and the texture left behind by working quickly and more intuitively. I also like the depth and variety of colour. So now, how to progress? Hmmmmm………I guess it will resolve itself as I start into the second year of my blog and my more focussed attention on drawing. I have more or less decided that I will commit myself to doing a drawing a day for 2015….and have reviewed Frederick Franck’s guidelines ‘The Awakened Eye’ from my post way back in June. 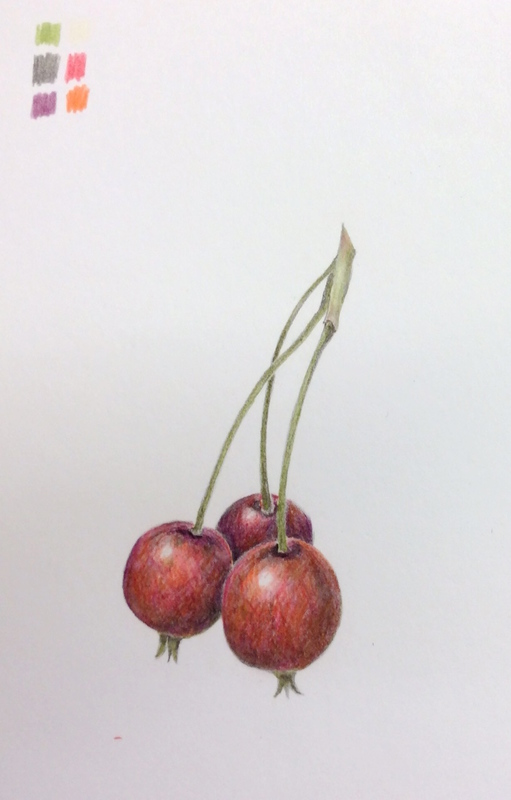 This entry was posted in Draws Shoots and Leaves and tagged a drawing a day, botanical art, colored pencil, coloured pencil, drawing, Frederick Franck, wendy hollender on December 20, 2014 by Draws Shoots and Leaves. This entry was posted in Draws Shoots and Leaves and tagged words on December 17, 2014 by Draws Shoots and Leaves. Now that the new pencils are sorted and organised I have been able to follow up some suggestions that interested me in the book ‘Botanical Drawing in Color’ by Wendy Hollender. She suggests a very limited palette of colours (just 20) from which you should be able to draw most plants. Given that I am now the owner of over a 100 coloured pencils I was interested to try out her methods. Her starting point is the primary colours red, blue and yellow and she chooses a warm red and a cool red, ditto with the blue and the yellow – so six primary colours. 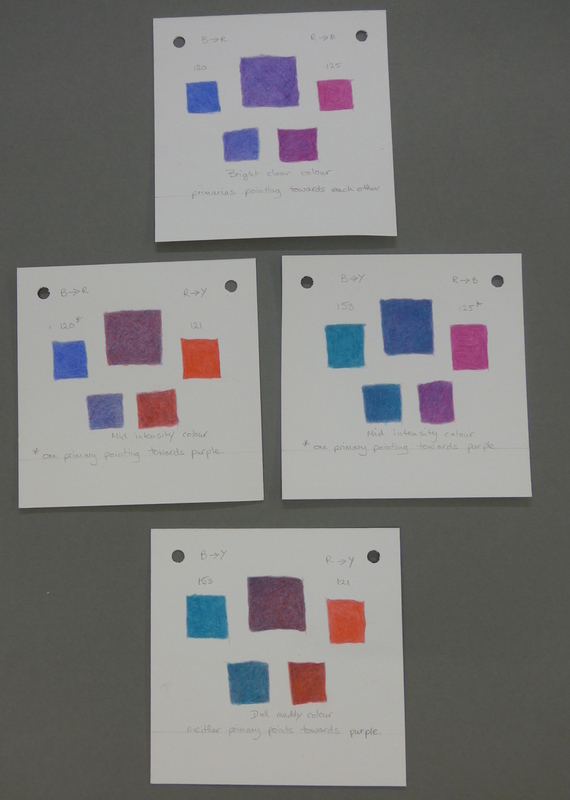 She then adds the secondary colours purple, orange and green (two greens). 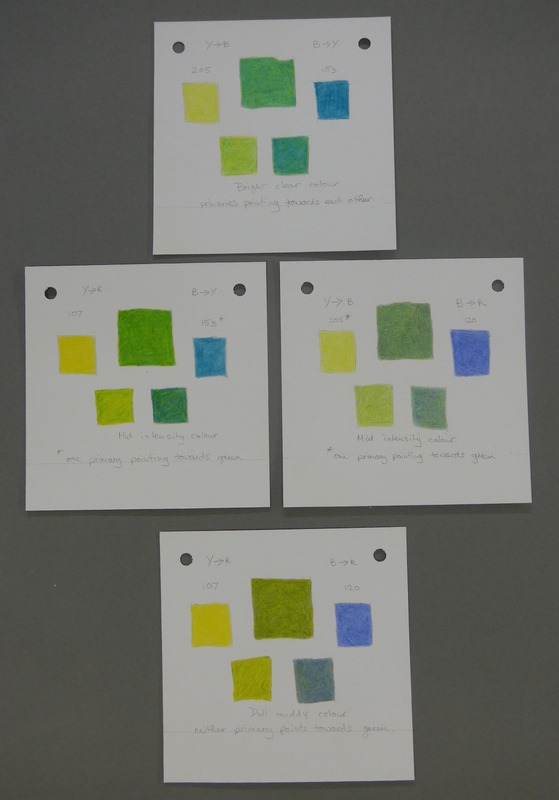 Then dark colours – sepia, indigo, red violet and another green, then four earth tones. Lastly white and cream for tints, highlights and burnishing. 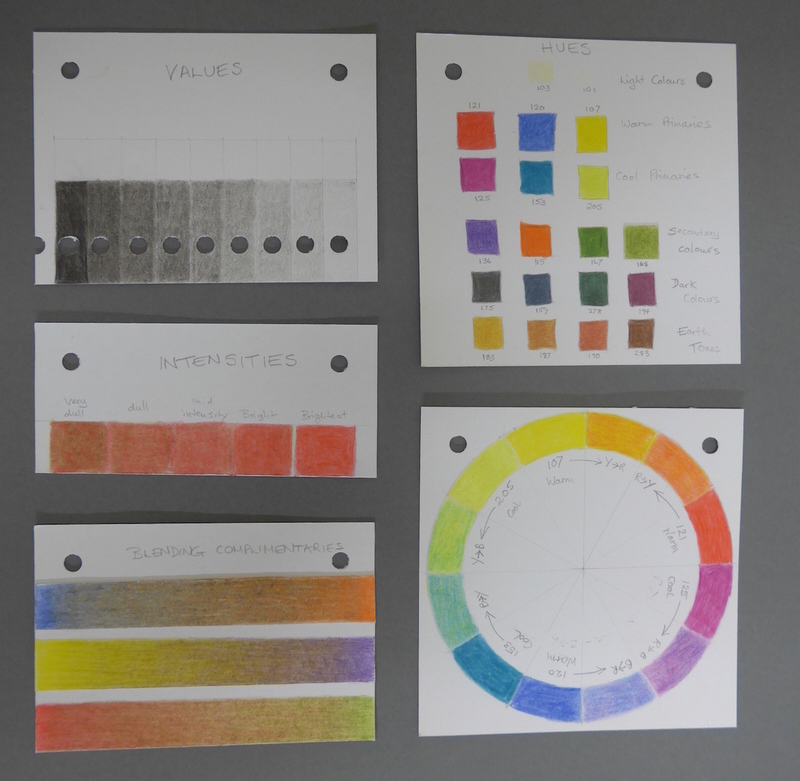 I followed along from Wendy’s book and made myself a colour wheel with twelve hues from the six primary colours; a value bar using sepia depicting nine values from very pale to very dark; an intensity bar with five steps from bright to very dull; and colour bars blending complementary colours together to make dull/brownish tones and colours. 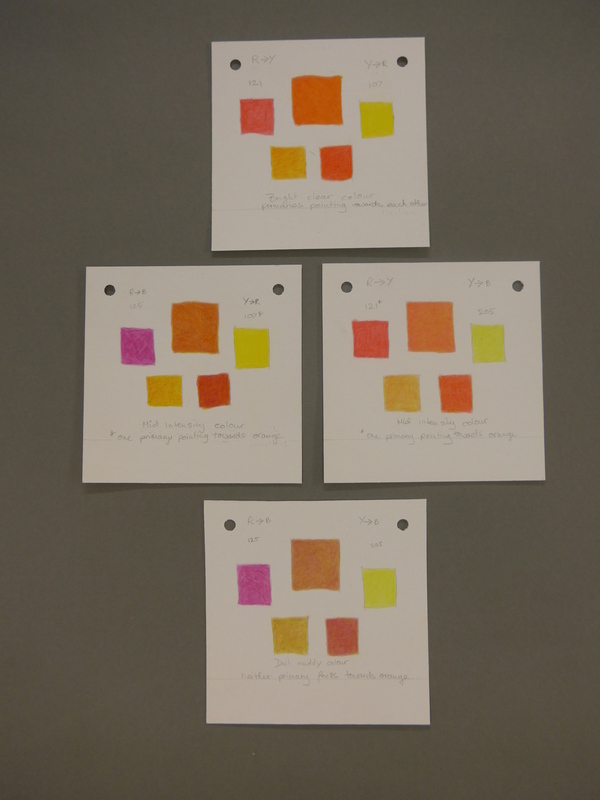 Lastly I followed her guidance and created colour blends using primary colours. I must say I sat and scratched my head over all this, and had to turn the radio off for a while so that I could concentrate! However I think I have it now and below are the swatches I created. I am amazed at the variety of colours and am happy that I now have a small roll of twenty pencils that I can take out with me and know that I should in theory be able to draw almost anything. Earlier this week I posted my picture with the purple berries from last week to a Facebook group called Botanical Art for Beginners. I have been lurking around this group for some months now, not having the courage to post any of my drawings, but finally I decided to take the plunge. I received 124 likes and 24 people added supportive comments and suggestions, I was really touched and pleased; social media sometimes gets a bad press but it is wonderful to be able to connect with other artists in the same field as there are not many local to where I am (or at least I don’t know of any). This entry was posted in Draws Shoots and Leaves, technique and tagged colored pencil, colour swatches, colour theory, colour wheel, coloured pencil, complementary colours, primary colours, wendy hollender on December 13, 2014 by Draws Shoots and Leaves. This entry was posted in Draws Shoots and Leaves and tagged words on December 10, 2014 by Draws Shoots and Leaves.